I doubt very much that I am alone in being concerned about how my mind works. I worry about days that I find myself depressed or the nights I cannot sleep and so forth. Yes, there is mountains of books and philosophies and >gulp< medications that can help me try to deal with those issues. 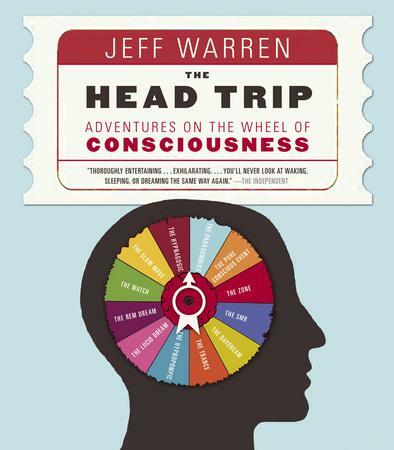 But Jeff Warren’s exploration of his own issues in The Head Trip: Adventures on the Wheel of Consciousness seems to have enlightened me the most in my personal journey of better awareness of my mental health. The book you are holding is not a typical book on consciousness. It’s not about the qualia, or the language instinct, or what it feels like to be a bat. Nor is it a typical brain book – describing how fear works, or the uses of the cerebellum, or what happens when you electrocute your amygdala. Well, this books is in part an encyclopedia of “that’s happened to me” moments, organized by adventures through various familiar and less familiar states of consciousness. For this reason, this book is also about you, because you have these moments too. And I’ll say this outright: you won’t believe where you’ve been, and where your capable of going. When I was a kid I used to lie in bed and wait for sleep. I did not wait patiently; I was vigilant. I wanted to catch the exact moment that sleep set in, I wanted to pinpoint it – there it is. Now I am asleep. Except it never worked. I would pop one eye open and wonder, “is this it? Am I asleep now?” An hour would pass like this. And then suddenly it would be morning, and my mission would be forgotten. Util that evening, when I’d take up the challenge again with new resolve. The thing is, there really is an exact point at which you fall asleep: you can see it on your sleep-recording chart, or “polysomnography.” Philippe Stenstrom showed me mine. “Right there, that yellow line is where we marked sleep onset. You can see the change in your brain waves . . . they flat line. Alpha disappears. This characteristic of someone falling asleep. Stenstrom is a graduate student in psychology at the University of Montreal. He works for a pioneering sleep researcher named Tore Nielsen, who runs the Dream and Nightmare Laboratory at Montreal’s Sacre-Coeur Hospital. Phil is friendly, and passionate about his subject. When I met him at Nielsen’s sleep lab, he looked slim in his dapper white lab coat, but he had the hollow-eyed, slightly gaunt look that I have come to associate with researchers who stay up all night staring at polysomnographs. This is a very detailed book. And I have to admit that I skimmed over parts of it I felt that were a bit overwhelming. But in most part, this was an enlightening read. And one I will be re-reading again in the future. It bears repeating: We can learn to direct our own states of consciousness. Lucid dreaming, hypnosis, neurofeedback, and meditation all point toward the ability to self-regulate consciousness. This is no one-off special effect; the latest advances in neuroplasticity show how the brain is radically shaped by experience, and that thinking and experiencing in all guises – at night and during the day – are a kind of doing. Any action repeated in the brain is more likely to reoccur; thus the potential is there to customize our own mental processes, to create healthier, suppler, wider-ranging minds. This is an astonishing capability. It suggests that our minds are still evolving, but no longer under the sole direction of natural selection; rather, we’ve jumped to a faster mechanism of change: culture. Our ability as a species to customize new environments is feeding back into our brains and changing the way we think, the way we are conscious. This is both supremely hopeful and utterly depressing, since it means that in nurturing, enlighten environments we may be able to cultivate whole new standards of mental health, but in violent, regressive environments we risk spawning awful new permutations of mental affliction. Technology – that great, on rushing field within which our minds are shaped – compounds all of this, for better or worse. The Head Trip: Adventures on the Wheel of Consciousness by Jeff Warren was a book that awoke me about my thought patterns and consciousness. An enlightening read and one I will be rereading again soon. The beauty of a good piece of literature is the ability to empathize with the plight of the characters. A good writer can make a reader relate to the people he is talking about in a few simple words. 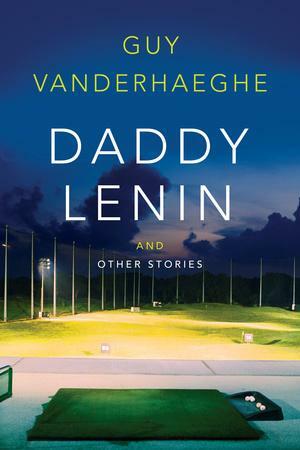 Guy Vanderhaeghe is one such writer with that skill and he brings that skill forward repeatedly in his latest collection called Daddy Lenin And Other Stories. Charley Brewster’s hands hadn’t given him a moment’s grief for nearly forty years, had behaved themselves, and then, after the young couple moved into the apartment next door, they began to torment him relentlessly. Not to say that Vanderhaeghe’s writing is not without some lyrical quality here. The stories flow, the characters ebb with the flow of the story and the reader’s mind rides along with each story to absorbing each element into their own mind. This is a great read for a quiet moment to ponder and reflect on. The prospect of another dining experience at the Koenigs’ kept me on edge all the next afternoon. Around four o’clock I heard a knock at the door. This was surprising, my family never had visitors. I parted the curtains, looked out, and saw Sabrina Koenig on the step, visible to anyone who might be passing by, a brown paper bag clutched to her chest. I rushed to the door, wrenched it open, and barked, “What!” straight into her face. She didn’t flinch; she grinned. “Hello, Billy Dowd, today’s your lucky day,” she said. “Get in here.” The instant she crossed the threshold, I slammed the door, panicked somebody might see me and her together. I pointed. i didn’t know what else to do. She set off in her halting, wincing stride. after a few moments of bewildered indecision, I followed, found her unpacking canned goods, fresh vegetables, and a package of meat. I asked her what she thought she was doing. Vanderhaeghe has brought forward interesting situations in the human condition that may initially seem odd but do occur in our lives. We do often wonder what has happened to the spurned lover or that overly-teased classmate as we get older. Here, Vanderhaeghe gives us a few scenarios where a protagonist finds out what has happened to Person X who may have had a certain greyish impact on the protagonist’s life. Tony opened his eyes, ran his hands over the sheets and his eyes around the room. He called “Susan?” several times, but there was no answer. She was gone. He would have liked it if she had stayed; her presence, any presence, would have been welcome after the dream he had just awoken from. In it, he and his wife were waiting to board a flight in a vast airport reminiscent of Heathrow. When Betty told him she was going to take a quick look around the duty-free shop, he merely nodded. She disappeared into the crowd of travellers, and as she did, he glanced at his watch and was astonished to see that they had lost track of the time. It was only a few minutes before their gate would close. He stood up to call her back, but before a word left his mouth he suddenly found himself in the Qu’Appelle Valley on a fiercely windy day, whitecaps breaking on the beach. Each time the waves slapped the sand, he grew more and more uneasy, sure that there was something he had forgotten to do, something besides keeping an eye on their departure time, something of the utmost importance. but for the life of him he couldn’t think what it was. He sensed it hovering behind him, back where Betty’s beloved cottage stood. But he couldn’t bring himself to turn and face it because if he did that, he would have to acknowledge the neglected presence. Tony eased himself out of bed and wet to his laptop. Staring at the screen, he tried out and tested various phrases in his mind. Then he tapped out an email. Daddy Lenin and Other Stories by Guy Vanderhaeghe is a brilliant piece of literature. Here, we are given a selection of elements important to the human condition which we otherwise wouldn’t consider. A brilliant and insightful read. Illustrations in a book are somewhat important but when a book is created without words, then the illustrations take on a whole new role in a book. 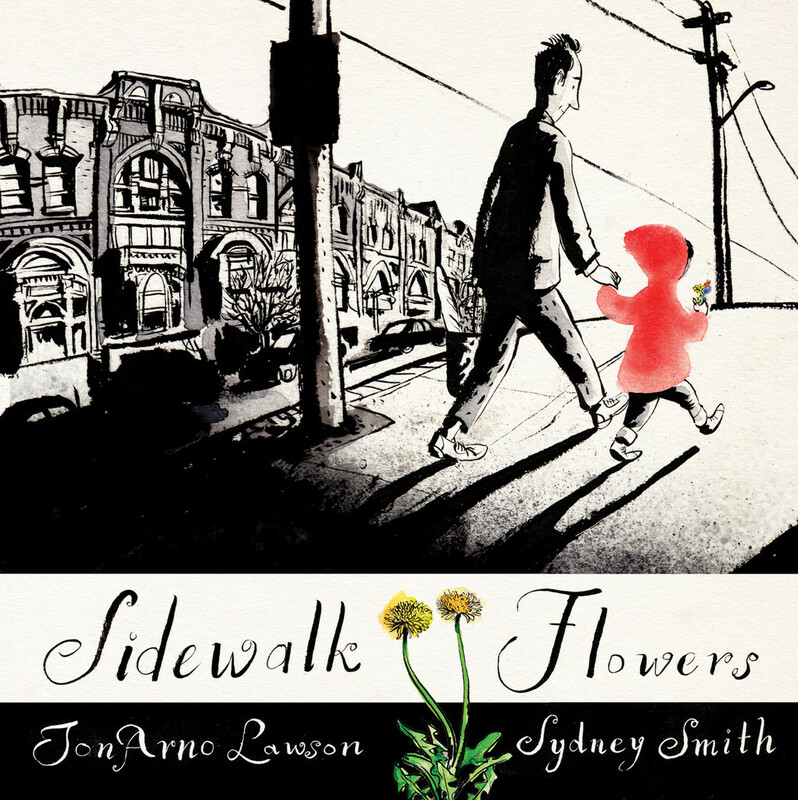 Illustrator Sydney Smith found himself in that situation when he drew the artwork for JonArno Lawson’s Sidewalk Flowers. (Link to my review) Smith recently answered a few questions about his experiences. 1) How are you finding the reaction to “Sidewalk Flowers” so far? Has there been any memorable responses to it? A: The response to Sidewalk Flowers has surpassed all of my expectations. There were moments when I was working on the book that i thought either this could do well or this is total garbage. I think if you have that thought it’s a good sign. It means the work is probably good and that you are taking a risk. There have been lots of reviews from around the world, some that i have had to Google translate. Its pretty exciting for me. People are seeing my drawings from China to Mexico. 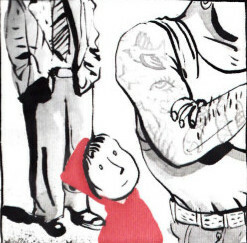 2) How did you like creating the illustrations for “Sidewalk Flowers?” Was bringing JonArno Lawson’s (and his daughter’s) vision to light an easy thing to do? How long did it take for you to create all the illustrations? A: I loved working on JonArno’s beautiful and poetic story. I moved to Toronto from Halifax when i first started working on the project and that bit of culture shock informed the drawings. It took about six months from the sketches to the finals. 3) Are you working on anything new right now? If so, are there details you care to share? A: I’m working on a picture book called “The White Cat and the Monk” by Jo Ellen Bogart, I’m illustrating a historical picture book covering the 150 years of Canada, I’ve starting working on a chapter book written by Esta Spalding and I’m working on drawings that will be on the walls of a children’s ward of a Toronto Hospital. I’m busy but really excited about everything I’m doing. A: I think my early love of books and comics led me to illustrating. I drew a lot when i was younger and when i went to Nova Scotia College of Art and Design I pushed against it at first but I had some great teachers. I remember Dan O’Neill, my printmaking teacher, handing me a pamphlet with the Governor General shortlist of Children’s Illustrators. He said, this could be you. I never forgot that. I admire lots of illustrators. It’s hard to narrow it down but lately its been the weirder the better. The books I currently have signed out from the library are illustrated by Charles Keeping and John Burmingham. I’m trying to push myself to take more risks but its hard. My hand doesn’t want to obey and in the end we just compromise. 5) Your work has illustrated books, magazines and various forms of musical recordings. Is there a preferred area of work that you enjoy illustrating for? If yes, why? A: Children’s books are where I feel most comfortable. For the most part i am left to myself, and there are few limitations other than my own criticizing. With other kinds of illustrations like Music and Editorial you are always representing someone else. And that makes people nervous and the risk of being micromanaged is greater. I don’t respond well to that. 6) Your bio page on your website states that you studied in Nova Scotia but now live in Toronto. How do you – as an illustrator – enjoy living in Toronto? Does that city’s cultural life provide you with any inspiration for your work? A: Toronto is a completely different pace for me. In Halifax I balanced work out with other activities. Coffee dates, sandwich meetings, beer rendezvous’. But since moving here its more intense. There are long days that sometimes stretch into the next day, and 7 day work weeks. I love working on Spadina because i have the Lillian Smith library and its children’s books and the Art Gallery on Ontario so close to me. Also China Town is so busy, on nice days, i sit on a bench and draw the traffic during my coffee break. 7) You seem to have an active role on both Facebook and Twitter. How do you like using social media for your work? A: I don’t know if i have that figured out yet. Tumblr, and Twitter seems to only work if you are consistent and I’m not. I don’t think i will fail in life if i never figure out how to tweet but i can understand how its a good method of reaching an audience. I have a hard time believing anyone wants to hear me talking about my brunch. Maybe i should stop tweeting about my brunch. 8) I know most writers get to go out on book tours for their works, but do you get to attend functions for any of the books that you have published? If yes, what was that experience like for you? If no, is it something that you would like to do? A: Oh yes. Book tours are fun but they don’t happen for every book. I had the privilege of touring with Sheree Fitch when i illustrated her books. I learned a lot from her. Like don’t sign your name on a child’s forehead even if they ask. Sidewalk Flowers was launched in Halifax which meant so much to me. There were a lot of people there including my family and friends; some of whom i haven’t seen in years. I teared up when i gave my speech. The illustrators of children’s books get more attention than illustrators of other media. I’m just starting to realize how vast the children’s book universe is. There are a lot of people in it that just want beautiful books for everyone. There are no agendas, no scams, just a lot of people making beautiful books that inspire, move, excite, humor, and offer escape. One of the major aspects of the human condition is how humans deal with change. We set ourselves with certain patterns in our lives and then something ‘out of the blue’ happens and we must somehow adjust to that change. It can be quite a shock to the system. That is what happens to the main character of David Penhale’s novel Passing Through and his journey makes for an enlightening read. It was Friday, the beginning of the weekend in the Middle East, a day to lace on a pair of boots, stick a map in your pocket and head for the desert. But Daniel Foster was in Toronto, not Dubai. In his daughter’s townhouse, not the apartment in Golden Sands. Tall and tanned, he had dark hair with a touch of silver at the temples. His business suit, tailored by Frazier & Son of Savile Row, had won the respect of many a maitre d’. The box of Froot Loops on the counter belonged to his granddaughter. He tugged open the fridge and frowned at the empty shelves. Out for breakfast then. Foster put on his raincoat and patted for the keys to his Mercedes. He felt a jolt of panic. He had no keys. The sheiks had cut him loose. Bracing himself against the mild September day, he stepped out the door and spun around to inspect 27 Mazurka Street. It is easy enough to empathize with the main character David Foster. We all have had one or two major goals in our life change because of some sort of odd circumstance. Foster finds himself in that type of situation. After working for years in the middle east, Foster is about to retire and buy a villa in Thailand. But, while visiting his daughter and granddaughter in Toronto, the bank that holds his savings crashes, and Foster needs to build an existence that is more North-American suburban than he is use to in order to survive. In the locker room, Foster punched the time clock and changed into his uniform. He felt self-conscious as he made his way to Nails ‘n Glue wearing the Grandpa gear, but, with so many men wearing the same costume, no one paid him any mind. It was, he supposed,like being naked in a nudist colony. “Fine.” Foster ran a hand over the counter. Like all the props in the store, it was fake. In Florida, he had stuck his head in the fixtures department and watched a man beating a board with a length of chain. Best way to age pine, the man had said. As if the world wasn’t aging quickly enough. There is something endearing about Foster’s fall from grace and his search to regain his old life. His thoughts and observations as he tries – and many cases flubs – an attempt at some sort of existence during his stay in Toronto provides observations that should be reflected on in general. His granddaughter looked at him skeptically. “Foster?” Shawna looked at him with flint in her eyes. “I’m not four years old.” She pushed back her chair. Sharp cookie, his granddaughter. Didn’t miss a thing. “I’ll keep this warm for you.” Foster slipped a plate over Shawna’s bowl. He watcher her walk down the hall to her room. A thumping rhythm erupted, setting the bubble-glass animals jittering around in the wall unit. 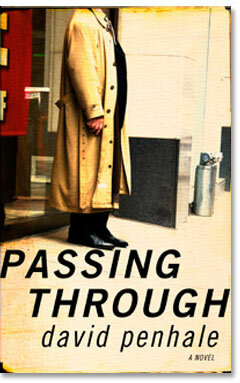 Passing Through by David Penhale is a enlightening look at the human condition. Change is something we all must deal with in our lives, and witnessing Daniel Foster’s journey in how he deals with change and crisis gives readers food for thought. We tend to hear about the simple things that make up a historical moment in time. Take the 1960s for example. For those of us who weren’t around to live through that era, we are bedazzled by simple images and concepts that made up that turbulent time. But we aren’t given insight of what the complexities and the difficulties of that time was like. That is the beauty of a good piece of literature. Through the eyes of a well-created protagonist, we can honestly understand what a time period was like. That is why Real Gone by Jim Christy is such a great read. That summer, anyone my age and Ellen’s age who considered themselves anti-establishment in any way or were inclined to adventure or who were simply after kicks would have been foolish not to go to San Francisco. Larry Demeter and his Italian girlfriend Laura Longo were all for it and so was Ted Rogel but he didn’t have a girlfriend. I suggested he drive up to New York and put an ad in the Psychedelicatessen on Tompkins Square. He showed up at my apartment on Elderidge Street and I took him over to the place; he pinned his note on the bulletin board ‘Chick wanted for trip to San Francisco! Must travel light’, and when he got back to West Chester, just outside of Philadelphia, there had been three or four calls. The next day, Ted was again knocking on the door, and with him was a beautiful 22 year-old girl in high heels, tight black satin slacks and a flowery blouse. Her name was Dalia and she was wearing three or four necklaces, a dozen bracelets, had rings on every finger and on most of her toes. She was part Vegas showgirl, part hipster road chick. In other words, she was just my type. We looked at each other and it was like there was a magnetic field connecting us. We both said hello, got into the fishtail Plymouth, and from then on ignored each other until we got to California. In South Carolina I’d heard music when we pulled over to get something out of the trunk and down the road saw a few black people go into the forest, followed minutes later by several more, all carrying boxes, baskets, bottles of booze. I went over and found the trail, and my companions reluctantly followed me into the piney woods. There were bonfires in a clearing, lanterns powered by car batteries and a pig turning on a spit. Four guys in suits and bib overalls were playing rhythm and blues that was fifteen years out of date and just the way I liked it. People looked but nobody hassled us. The alto sax was held together by electrician’s tape. It was as if time stood still in the woods; it was eternally 1948, and Wynonie Harris was at the top of the Race chart. But the music either bored my companions or they were afraid the darkies would get them. So we left the woods and emerged into July 1967, and back on the road. The long, long road to the coast, and all the way across the country, the big song on the radio had nothing to do with white rabbits or flowers in your hair; it was Bobbie Gentry’s “Ode to Billie Joe.” It was the summer of love. While it is a novella, Real Gone has a complex plot nonetheless. Readers travel with the protagonist through the turmoils and excitement that was America in 1967/68. We gain an honest understanding of the feelings and emotions of the time period, not just a saccharine review of those years. The book reviews several trends and events of the 1967-68 era but it is the interpretation of those events of the gives the books it’s true feel. Christy has a very simple style that makes the novella easy to read and comprehend. I drove to Atlantic City to see Charlie Leeds. I hadn’t seen him since he pretended to be jack Ruby’s brother. He was actually at home when I telephoned, at his mother’s house at 44 South Windsor Avenue. We arranged to meet on the Boardwalk neat the Steel Pier. The season was over and boardwalk nearly deserted. The saltwater taffy shops and souvenir stands, the tawdry lean-tos that would make a carnie blush, were all boarded up. Charlie came down the boardwalk with a kind of hobbled glide and he seemed to be listing, because of the wind, I thought, and the briefcase he held in his other hand didn’t help to balance him. But no, it wasn’t the wind, that’s just the way he was. We leaned against the rail, looked out at the angry gray ocean and Charlie told me that he too was going to prison. I knew he’d been arrested and I’d heard the details from Nanette, Ellen’s sister, and Charlie’s long time friend. I remember how four years earlier I had made the rounds of Atlantic City bars looking for this character that had become legendary in my mind. And soon I realized was legendary in fact. He had played with famous and infamous musicians beginning at the end of the big band era. Charlie Shavers, Buddy Rich, Woody Herman, Stan Getz, Lennie Tristano and his great buddies Brew Moore and Joe Albany. Nanette and I finally ran into Charlie, two nights after we began the hunt, at a place called Cody’s Bar. He was playing his bass with a quartet on stage but he didn’t remain on the stage for long. He was so far gone into the music that he just fell over and onto the floor, working the strings the whole time. And he was a great writer, too. 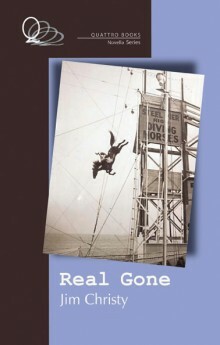 Real Gone by Jim Christy is an detailed look at life in 1967-68. The novella gives honest insight to that over-discussed era and is a insightful read. I am always surprised to find silly nuances from my life reflected in literature. No doubt if I didn’t read, I would never give these items a second thought but because I do, I find myself pondering these things. And that isn’t a bad thing; to reflect on one’s existence. 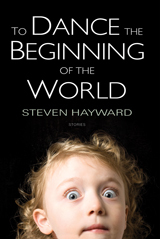 That is why I enjoyed reading Steven Hayward’s collection of short stories called To Dance the Beginning of the World so much. Strava is a smart phone application invented by Michael Horvath and Mark Gainey, a pair of friends who were crewmates in college and missed competing with each other after they had moved to different cities. Early in 2009, they realized GPS data had become specific enough to identify climbs based on elevation and distance and that it should be possible to record people’s times and compare them. This is what Strava does. It tracks your movement. It tells you how fast and how far you ride and compares you to the rest of the world. You upload your data and it takes your measure. The application launched in early 2010 and now has about ten million users worldwide. I am one of them. My name is Tim Babcock, and I’m forty-four years old. This puts me at the very edge of the thirty-five to forty-four age bracket on Strava. Twenty-nine days from now I’ll turn forty-five and expect to see a consequent jump in my Strava rating. Hayward has a simple writing style but he is able to enlighten the reader with complex considerations with the scenarios he has created here. They are thought-provoking and the mind’s eye of the reader is awaken on numerous occasions with profound connections to the reader’s life and the characters that Hayward has written about here. It took him a minute to realize that I was joking, but when he did, he laughed and laughed, as if the laughter had been coiled up inside of him and waiting for a chance to escape. By this time I was used to it. That’s one of the things about everyone knowing that your mother’s just died. If you make any kind of joke, anything that’s even remotely funny, the rest of the world will just kill themselves laughing. I suppose this is because most of the time they’re standing there worried you’ll burst into tears, or get into some details they don’t want to know, or say that you’re going to kill yourself. Then, if you make a joke, all of that worry comes out all at once, as a laugh. Hayward has also taken a couple of stories and used footnotes to elaborate on the narrative. It is an interesting feature. The original story line is simple but the footnote shows a complication in the person’s life that seems familiar to a reader in a certain way. BEVISO, Philomena Rosario – At her home in Toronto, (footnote cited) suddenly, on Thursday August 19, 1985, in her 78th year. Daughter of the late Carmella and Paul Luciani and beloved wife of Contanzo. She will be sadly missed by her son Theodore and her grandson Paulo. Philomena was making pizza dough when she felt the pain in her left arm. She dropped the dough and tried to steady herself by gripping the kitchen counter. The her knees buckled and she fell to the floor. The pain spread through her chest and she found she could not stand up. She lay on the floor and looked at the ceiling. “It’s very dirty,” she said out loud the the empty kitchen. Constanzo Beviso was out in the garden and did not know what had happened until it was too late. He walked into the kitchen carrying a large cucumber and a basket of green beans. He dropped them both when he saw his wife. He knelt down on the floor and listened for her breathing before calling the ambulance. He went back into the kitchen and closed Philomena’s eyes. To Dance The Beginning of the World by Steven Hayward is a light read yet filled with some deep reflections of life in our times. A great book to ponder one’s existence about after reading.